…with Hangin’ Out professional Grampians guided rock climbing tours, courses and adventures. The Grampians (in Victoria, Australia) is renowned for some of the best sandstone rock climbing by climbers from around the globe. We create a safe environment for you to experience this for yourself. On each session, we provide you with certified guides, top quality equipment, and the combined benefits of our knowledge and guiding experience. We have a deep passion for climbing in all its forms, from easy top-rope climbs, to tagging a summit after a great day in the mountains. We work hard to make sure you have an outstanding experience, and we hope you will join us to experience this exhilarating sport. Choose from our introductory Get Climbing (4 hr) session, our Rock On (6 hr) session or a Rock Intro Full Day session. 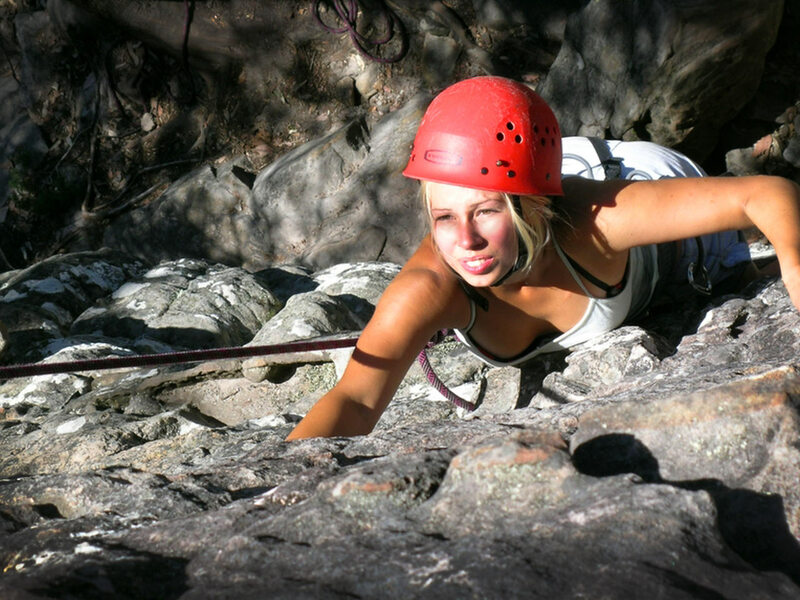 We also offer Private Guided and Multi-pitch sessions. Or choose to enjoy the full day Adventure Walk. All sessions are great for individuals, families and friends. Find out why Hangin’ Out is the perfect opportunity to get your school group climbing. With facilitated sessions to encourage communication skills, personal growth and learning though challenge, Hangin’ Out has an outstanding reputation for safe, quality sessions that are rewarding to students and staff. Our climb/abseil sessions are an excellent activity to provide your group with an enjoyable and memorable outing and enhance bonding, communication and personal growth. Find out how your group can benefit on one of our highly regarded sessions. Hangin’ Out has been operating rock climbing/abseil sessions to thousands of happy customers. We are passionate about sharing our love of climbing in the Grampians and aim to deliver a safe and enjoyable experience that focuses on personal development and achievement. All groups have a maximum 1:9 instructor/student ratio and all safety equipment is supplied, as well as climbing shoes. Hangin’ Out is fully accredited by National Parks (PV#1599) and ACIA (Australian Climbing Instructors Association), and endorsed by Tourism Victoria and Tourism Australia. As per Parks Victoria standards, Hangin’ Out is fully insured with the appropriate public liability insurance. Our sessions and programs are flexible and we can customise the course to suit desired needs and outcomes. Programs can be run any day of the week, morning or afternoon. All guides have either an Australian Climbing Instructors Association (ACIA) or Professional Association of Climbing Instructors (PACI) qualification, or both, have First Aid level two, and are experienced guiding in the Grampians National Park. Apart from being professional, our guides are fun and friendly, helping to maintain high energy within the group and giving a very enjoyable and memorable day. Nestled high above the valley of Halls Gap in the Wonderland Range, this is a remarkable climbing destination for all our customers. Lookout Point Wall is a more intimate site with huge views and incredible climbs. This site has a 22 meter abseil face and climbs ranging from 14 to 27 meters. Situated in the northern area of the Park, Summerday Valley has it all. Great views, a 22 meter abseil, climbs ranging from 10 to 25 meters. The amazing rock at Summerday Valley has helped give the Grampians its unsurpassed reputation for climbing. Also well suited to large groups with a wide range of experience and levels. We also take customers to Mount Arapiles and several other sites in the Grampians including The Watchtower, Bundaleer, Mt Rosea, The Mountain Lion and Mt Staplyton area.